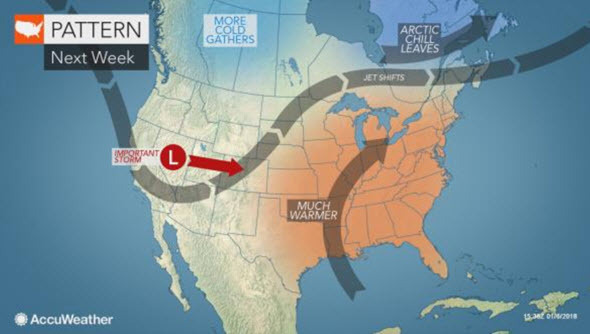 AccuWeather Global Headquarters – January 6, 2017 – AccuWeather reports after a brutally cold end to 2017 and start of 2018 in the northeastern United States, a milder weather pattern is on the way next week. A storm pushing into California early next week will send mild Pacific air across the contiguous U.S., cutting off the direct discharge of arctic air from Canada. During the transition period from harsh cold to air more typical of January, a bit of snow and ice could create slippery travel in parts of the region on Monday. As the wintry precipitation exits, the gates will be opened for milder air to expand toward the Atlantic Coast. One or more days during the second half of the week could be the warmest in nearly a month from the Ohio Valley to the mid-Atlantic and New England. During the first week of 2018, temperatures were 15 to 25 degrees Fahrenheit below normal from Indianapolis and Detroit to Cleveland, Pittsburgh, Washington, D.C., Baltimore, Philadelphia and Syracuse, New York. Compared to the coldest days during the past week, temperatures will be around 20 to 30 degrees higher for most days and nights next week. For example, New York City’s highs in the teens this weekend will be replaced with 40s F by late next week. Syracuse will trade in single digits for 30s and perhaps even 40s. The Southeastern states will also break out of their cold snap with 60s and 70s poised to make a comeback by late week. Those eager to get outside for an extended period of time can do so without the heightened risk of frostbite. Where the snow pack is deep, natural melting and freezing cycles could create slick spots on some roads and sidewalks late at night and in the early morning hours next week. Given the gradual rise in temperatures throughout the week, a rapid snow melt is not anticipated. However, should an approaching storm late next week draw in enough moisture from the Gulf of Mexico and Atlantic Ocean, the combination of soaking rainfall and melting snow could raise the risk of localized flooding issues. How quickly the next wave of cold air arrives will be dependent on whether the late-week storm speedily exits the East Coast or lingers for a few days. Regardless, the next cold snap will not be nearly as harsh as the latest spell.